I am not clairvoyant. But I was able to guess that this episode of Childrens Hospital, titled “The Gang Gets Sushi” (perhaps in homage to It’s Always Sunny In Philadelphia?) was not going to revolve around the gang getting sushi. Sure, I thought there might be some sort of wacky anti-hijinks where everyone just eats sushi and talks calmly for ten minutes. 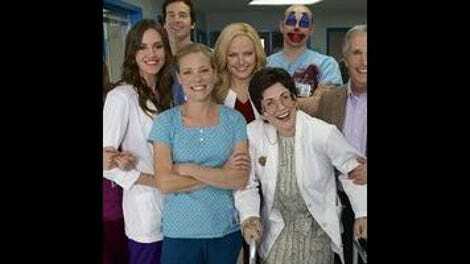 But that kind of low-grade meta-humor is beneath a show like Childrens Hospital. Instead, “The Gang Gets Sushi” (directed by David Wain) was a goodbye to Lola Spratt (for now), since apparently Erinn Hayes could only be in a few episodes this year. Lola is called upon by the U.S. Military to entertain people at parties with her genius impressionist skills. I think. The second part is definitely true, but what exactly she’s supposed to do at these parties didn’t really make sense to me (or her, really). Lola knows the secret to a good impression: Hone in on something specific someone does, and then do that thing just like them. Early on in the episode, Nurse Dori is made to do an impression of a doctor performing open-heart surgery on a patient when the rest of the gang wants to beat the line at a sushi place; I’m sure that goes fine. The final routine almost trips up (Lola puts Jerry Seinfeld and Forrest Gump in the same elevator, a complete impossibility) but the dignitaries are charmed by her surreal take. Probably the best laugh of the episode (for me) was Lola’s goodbye, though, and the nonplussed, vaguely sad/largely blank look that Glenn gave the camera for way too long. I know I was dissing anti-comedy at the start of this review but sometimes it’s just what we need. I’m gonna miss Hayes from the rest of this season, though! If nothing else, “The Gang Gets Sushi” is a testament to what a hilarious performer she is. I feel she doesn’t get the props of a Lake Bell or a Rob Huebel because she’s not cropping up in as much other stuff and does ordinary sitcoms like Guys With Kids, but she’s got such a sharp style and deserves to be making bigger waves all over the place. Jordan Peele was just showing off with that Morgan Freeman impression. I want to download Lola’s photo filter app for its 70s setting.